May 26, 2007: Sunny and Hot, Water Temp 76* and Clear. Caught bait early this morning and picked clients up at their dock at 5:30 am. Looked around for a few minutes while all the other fisherman were running around and set up on a 35 foot flat. Set out downlines rigged with Herring and the madness began. Every rod started getting bit and for the next couple hours I would catch fish on one flat then relocate on another school and do it all over again. 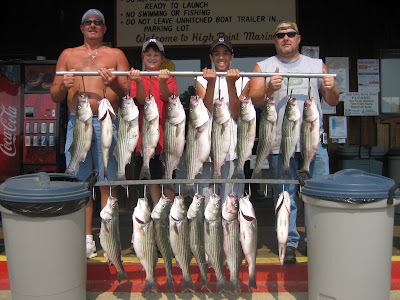 Today we had over 120 hits, caught over 30 Stripers with my clients keeping 20 fish. All this action on a holiday Saturday, and we were back at the docks by 10:30. This kind of action will continue to get even better in June and July.